MANILA – After holding our conference in an affluent hotel for two full days, participants at Pax Christi International’s Asia-Pacific regional consultation were growing restless. Peacebuilders like us tend to feel more comfortable on the periphery rather than in the center; on the streets rather than in the halls of power (though some members have proven remarkably adept at both). Just beyond our hotel walls lay a storied city of stunning contrasts between rich and poor; new and old; life and death. The Philippines is a beleaguered but proud nation which has served as a crossroads of civilizations for five centuries, leading to more than its fair share of suffering from colonization, corruption, dictatorship, poverty and war. We visited Saint Peter Parish: Shrine of Leaders on Commonwealth Avenue to understand President Rodrigo Duterte’s bloody “war on drugs”. Since mid-2016, the extrajudicial killings (EJK) associated with “Oplan Tokhang” have claimed more than eight thousand lives, raising significant concern over human rights violations. The Diocese of Novaliches, to which Saint Peter Parish belongs, was heavily impacted by EJK due to high concentrations of the urban poor settlements within its ecclesiastical boundary: North Quezon City and North Caloocan City. North Caloocan has been referred to as “the capital of the killing fields in the war on drugs”. 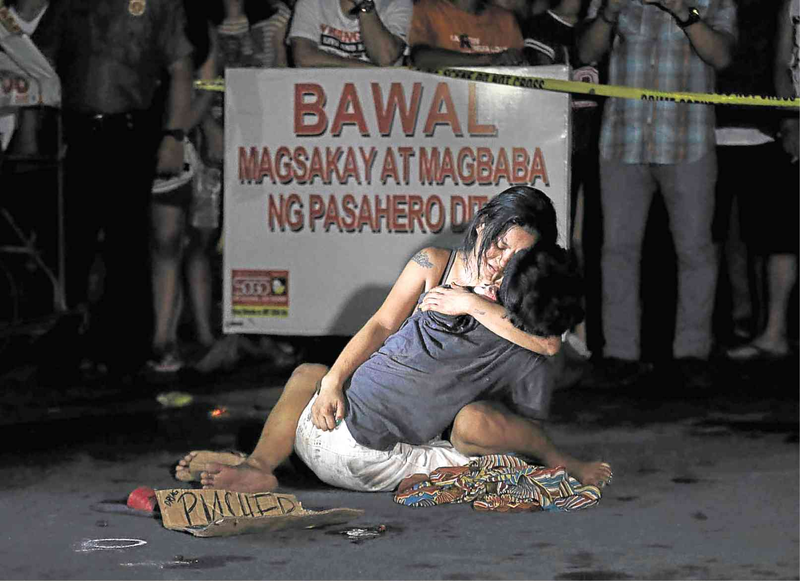 Last year, as many as 32 people were killed in Metro Manila in a single night. The church, having been lax in addressing the social crisis of drug addiction, was jolted into action given the rise in killings. The diocese capitalized on its established partnership mechanisms with government, i.e., UBAS which stands for Ugnayan ng Barangay at Simbahan (Partnership of Barangay and Church) as it felt compelled to act on behalf of the urban poor who could not speak out against the killers for fear of retribution. While church leaders supported the eradication of illegal drugs, they opposed the extrajudicial approach based on their principal commitment to protect human life. In the end, they devised a strategy that underscored the role of the Church in social facilitation/dialogue, psycho-social education, pastoral counseling, spiritual healing, and provision of sanctuary and volunteer outreach. At Saint Peter Parish, we received an orientation to a diocesan ministry called AKAP, which stands for Abot Kamay Alang-alang sa Pagbabago (“reaching out for new life”). When the war on drugs broke out last year, many drug suspects sought counsel from the church on whether to surrender to the police or to flee, recounted Fr. Luciano Ariel Felloni, parish priest of Our Lady of Lourdes in North Caloocan. Because the police had no protocol for removing a person whose name had been added to the watch list, AKAP initiated a dialogue with the Chief of Police and local city officials. The church negotiated a truce: on September 1, 2016, forty drug suspects surrendered themselves in exchange for a promise by police that they would not be harmed. AKAP invited the bishop and curia, local government officials, and the press to a public ceremony to validate the exchange. From that point on, thousands more people have surrendered themselves peacefully through the facilitation of the church. “The response to addiction is not sobriety but connection,” explained Fr. Antonio Labiao, parish priest of the Shrine of Our Lady of Mercy. “We have to connect the drug user to himself or herself, to family, to community, to one another.” AKAP provides holistic care for drug users, their families, and the affected communities. There are now six community-based drug rehabilitation program (CBDRP) centers throughout the diocese where drug users can seek treatment. The rehabilitation of drug addicts involves a clinical, spiritual, and vocational dimension. One CBDRP graduate whose drug addiction lasted more than twenty years recognized that he might be dead today were it not for the grace that provided him with a second chance to restore his life. Thus far, only one CBDRP graduate has fallen victim to EJK; many others have integrated into society and made significant contributions to parish life. Unfortunately, the church has not been able to shelter everyone from EJK. Four bereaved family members of EJK victims (who did not wish to be photographed) told stories that reminded us of the human toll of Duterte’s war on drugs. One woman begged the death squad to spare her 24-year old daughter so that she could at least visit her in prison; they shot her daughter execution-style in front of the family. Another woman prayed that the death squad would kill only her brother or his wife so that the children would not become totally orphaned; they murdered both parents. The vigilantes showed no regard for human dignity, or due process, or trauma inflicted upon family members. These poignant accounts brought all of us to tears. For a short time, we could accompany the survivors on their difficult journey from grief and frustration toward healing and reconciliation. An extremely disturbing aspect of EJK is the hidden profit motive behind each killing. The funeral parlor will typically arrive shortly after the incident to claim the corpse, and charges at least 15,000 pesos (approximately 300 USD) to release the body of the deceased. Because this is an impossible amount for urban poor families to pay, many victims never receive proper burial or are forced to deal with loan sharks. It is believed that the vigilantes also receive 15,000 pesos for each EJK they carry out. What kind of society values people more in death than in life? How can a program that creates such insecurity among poor people be justified in the name of security? What are the models of nonviolent resistance to EJK? We struggled openly with these questions. The church acknowledged that it is still in the first stage of response to EJK, and that it would like to achieve more in the field of prevention. AKAP already organizes neighborhood watch groups to monitor unusual activities and document baseline profiles of orphans. AKAP invited us to brainstorm solutions concerning the sustainability of its programs, especially educational assistance and livelihood support for survivors.